MEXICO CITY & NEW YORK--(BUSINESS WIRE)-- BlackRock (NYSE:BLK) and Citibanamex, a subsidiary of Citigroup Inc. (NYSE:C), today announced a definitive agreement for BlackRock to acquire the asset management business of Citibanamex, subject to regulatory approvals and customary closing conditions. BlackRock and Citibanamex will also enter into a distribution agreement upon the closing of the transaction to offer BlackRock asset management products to Citibanamex clients in Mexico. Through its network of 1,500 branches in Mexico, Citibanamex provides wealth management products and services to more than 20 million clients. The transaction involves approximately US$31 billion in assets under management of Citibanamex, across local fixed income, equity and multi-asset products, primarily for retail clients. The transaction is part of Citi’s emphasis on expanding access to best-in-class investments products, rather than on manufacturing proprietary asset management products. 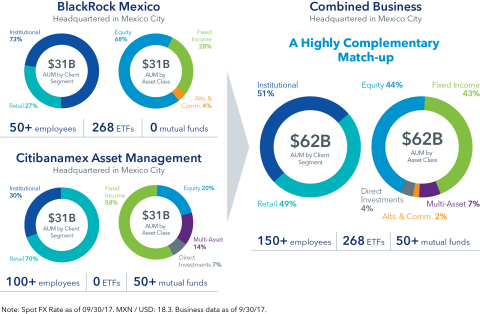 BlackRock’s business in Mexico currently focuses mostly on institutional clients, offering international investment and risk management products and services across asset classes, strategies and geographies. The agreement builds upon the long-standing relationship between BlackRock and Citi and brings together two leading firms to offer a wider range of products, enhanced technology and investment capabilities for clients. Citi Institutional Clients Group advised Citi on this transaction. The transaction is expected to close during the second half of 2018. The financial impact of the transaction is not expected to be material to Citigroup or BlackRock earnings. Terms were not disclosed. Grupo Financiero Banamex, S.A. de C.V. (Grupo Financiero Citibanamex) is the leading financial group in Mexico. Following a universal banking strategy, the Group offers a variety of financial services to companies and individuals, including commercial banking and investment, insurance, and investment management. The institution, founded in 1884, has an extensive network of distribution of 1,496 branches, 8,510 ATMs and more than 21,800 offices located throughout the country.